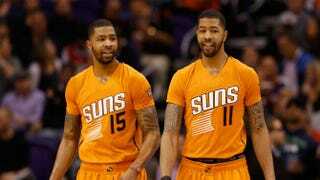 The Phoenix Suns’ Marcus and Markieff Morris are under investigation, accused of committing felony aggravated assault, according to AZ Central. Phoenix police say the assault occurred after the twins found out that a man was sending their mother “inappropriate” text messages. The victim, Erik Hood, told Maricopa County police that he grew up with the twins and supported them through high school in Philadelphia but that the relationship went south. According to Hood, the assault occurred in January after a basketball game. Hood said a 25-year-old man named Julius Kane was the one who told the twins about the text messages and assaulted him after the game. Hood said that once he escaped, he was assaulted again by a group of five men, including the Morris twins. Witnesses at the scene told police that they saw the attackers flee in a Rolls Royce Phantom but that no one could identify them, according to the AZ Central report. As for the twins’ version of events, they’ve denied assaulting Hood and claim that they don’t even know him, but they admit being at the basketball game, according to AZ Central. Their mother, Thomasine, also claimed that she had not been in contact with Hood, but authorities say that they have proved otherwise, according to the report. Phoenix Suns President of Basketball Operations Lon Babby said that the situation will be monitored and that the team has no information beyond what was included in the police report.